Been a while since I really dug an entry in the Alien franchise, but hard to argue the vote when you sure as hell can’t argue those first two movies. Ellen Ripley, man. What a badass. Swell voting, folks. Hope you got mad candy from the neighbors this year. Follow-up question: What’s the general consensus on this upcoming Evil Dead remake? Skeptical? Psyched? Serenity now? I gotsta know, son! Glad Alien was voted number 1.
and here i was just thinking: when will this ‘paranormal activity’ silliness stop? 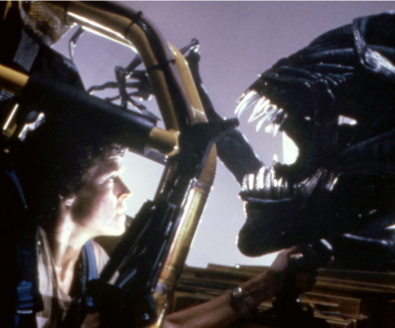 But isn’t Alien more of a sci-fi movie than a horror movie? I would have voted for Scream. I did enjoy Scream 4, haha. Haha. Glad to know I’m not alone. Alien all the way, love how the first two are so different, but both equally as amazing in completely different ways. Well said, man. But here’s the real question: which is one better? I’d have to say Alien…. just. you? Although not strictly a horror it fits the bill as far as I am concerned. A fine winner. Alien best horror franchise? Tuurlijk. Reviews komen binnenkort!